It was recently my birthday and I was looking for something that was a little out of the ordinary compared to what we normally eat. Then I remembered a post at Southern Plate for Chicken Poulet or as Christy calls it "Chicken Chicken." It was a hit and will be a regular addition to our dinner table from here on out. 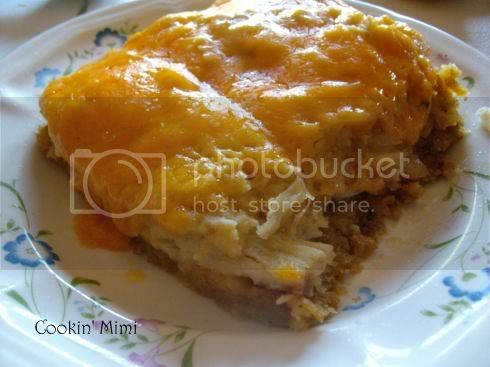 A chicken and stuffing casserole. Melt the margarine in the cup of water in either the microwave or stovetop. Place stuffing mix in a bowl and add the water and margarine, stir to combine. Add two of the eggs and the chicken broth and stir. In another bowl mix the chicken, mayonnaise, and onions. Place half of stuffing in the bottom of a 9X13 pan. Add all of the chicken and sprinkle with salt. Spread rest of stuffing over chicken. In a bowl beat the remaining two eggs with a cup of milk and pour over casserole. Cover and refrigerate at least eight hours. Remove dish from the refrigerator top with soup and let warm while oven heats to 350 degrees to prevent cracking. Bake uncovered for 45 minutes, top with shredded cheese and bake for five minutes longer or until cheese is melted. I don’t see why it wouldn’t work with regular stuffing mix, There is another casserole I make that is similar to this one and it uses a regular stuffing mix. It’s 1/2 cup of mayo. I don’t know how I left that out.